19. It’s not so black and white. It’s a myth that dogs only see in black and white. 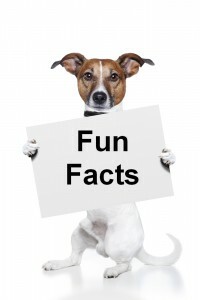 In fact, it’s believed that dogs see primarily in blue, greenish-yellow, yellow and various shades of grey. 3 Responses to "23 Fun Dog Facts"
I love whwt you guyts arre usually up too. This kind of clever work and coverage!